Facebook is currently the world’s most popular web site, with more than 690 billion page views each month. Facebook currently accounts for about 9.5% of all Internet traffic, slightly more than Google. There are 100 million new photos uploaded to Facebook every day. Facebook infrastructure must support platform services for more than 1 million web sites and 550,000 applications using the Facebook Connect platform. Facebook operates at least 9 data centers on both coasts of the United States, and is in the process of building its first company-built data center in Oregon. Although more than 70 percent of Facebook’s audience is in other countries, none of the company’s data centers are located outside the United States. Each data center houses thousands of computer servers. Facebook leases wholesale data center space from third-party landlords. Wholesale providers build the data center, including the raised-floor technical space and the power and cooling infrastructure, and then lease the completed facility. In the wholesale model, users can occupy their data center space in about 5 months, rather than the 12 months needed to build a major data center. This has allowed Facebook to scale rapidly to keep pace with the growth of its audience. 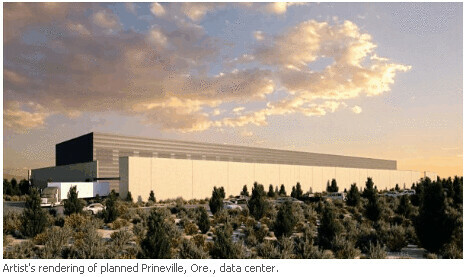 In January 2010 Facebook announced plans to build its own data centers, beginning with a facility in Prineville, Oregon. Facebook currently leases space in about six different data centers in Silicon Valley, located in Santa Clara and San Jose, and at least one in San Francisco. The company has also leased space in three wholesale data center facilities in Ashburn, Virginia. In the data centers where it currently operates, Facebook typically leases between 2.25 megawatts and 6 megawatts of power capacity. How Many Servers Does Facebook Have? This chart provides a dramatic visualization of Facebook’s infrastructure growth. In June 2010 Facebook was running at least 60,000 servers in its data centers, up from 30,000 in 2009 and 10,000 back in April 2008. What kind of software does Facebook Use? Facebook was developed from the ground up using open source software. The site is written primarily in the PHP programming language and uses a MySQL database infrastructure. To accelerate the site, the Facebook Engineering team developed a program called HipHop to transform PHP source code into C++ and gain performance benefits. How much Does Facebook Spend on Its Data Centers? An analysis of Facebook’s spending with data center developers indicates that the company is now paying about $50 million a year to lease data center space, compared to about $20 million when we first analyzed its leases in May 2009. The $50 million a year includes spending is for leases, and doesn’t include the cost of the Prineville project, which has been estimated at between $180 million and $215 million. How Many People Are Needed to Run Facebook’s Data Centers? As is the case with most large-scale data centers, Facebook’s facilities are highly automated and can be operated with a modest staff, usually no more than 20 to 50 employees on site. Facebook has historically maintained a ratio of 1 engineer for every 1 million users, although recent efficiencies have boosted that ratio to 1 engineer for every 1.2 million users.